I couldn't resist doing another inchie project for this Halloween. Don't let the list of materials scare you off. Just use what you have....you're creating little works of art in a collection and they always look amazing whatever you use! Like all inchie projects when I do this with a class we work on several at the same time. While one is drying we work on the next. 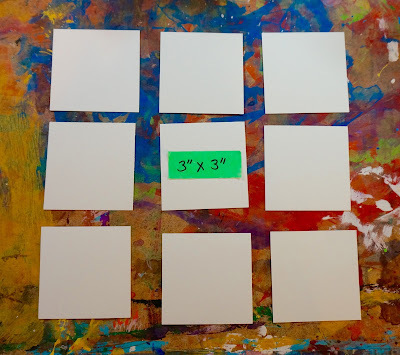 When I post the directions on the blog though it is easier for me to lay it out for you, start to finish, one square at a time. 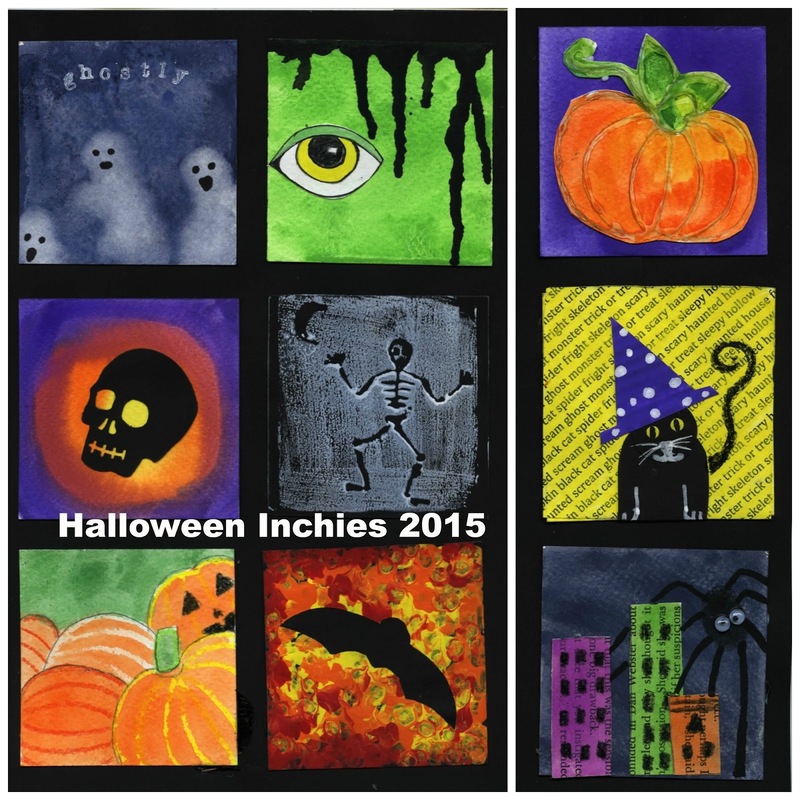 Cut your inchie squares. For this set I used squares 3"x3". 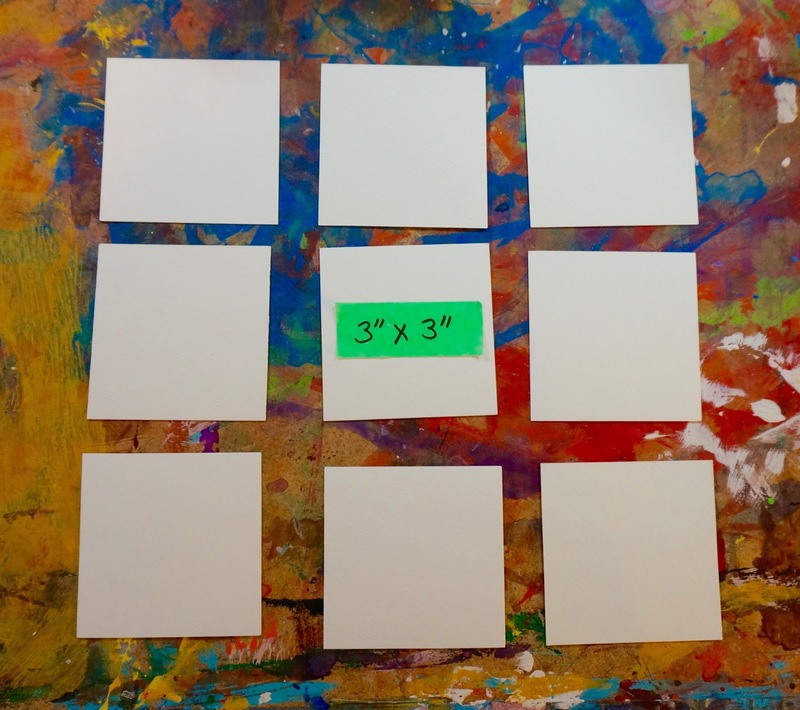 In the past I have used a lot of 2"x2" but I think the 3"x3" are my favourites. Big enough for the kids to work well with. 1) Paint square with watery deep blue (blue tempera with a touch of black). Before the sheen dries add a sprinkle of table salt. 2) When the square has dried brush off the salt. Dip a paintbrush in plain water. 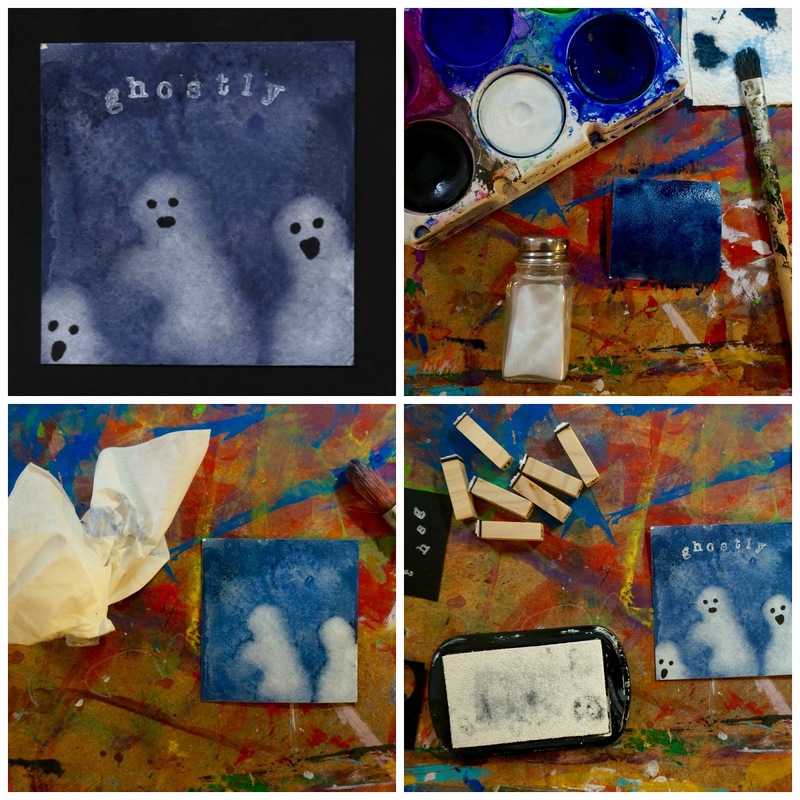 Paint the water where you want a ghost to be and then blot with a tissue. 3) Add faces with a sharpie or black pencil crayon. Add stamps or text printed off from the computer to complete the square. 1) Paint a square light green. Let dry. 2) Draw a large eye on some white paper. Colour it in or paint it. Outline with sharpie or black pencil crayon. Cut it out and glue to the green square off to one side. 3) Put a little black acrylic on a palette plate, add some water to it for an inky consistency. 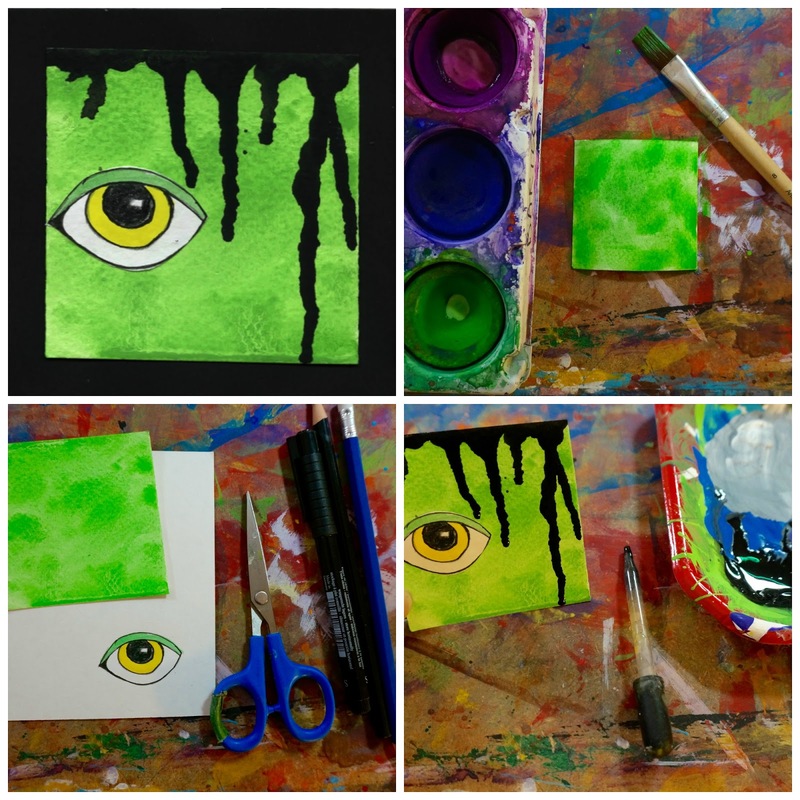 Using an eyedropper or a paintbrush drop some paint on the top edge of the square. Tilt the square up so the paint drips down. Add more as needed. This square is based on the glue resist technique. You could also use black glue (glue bottle with a couple of squirts of black acrylic paint added). 1) Take an inchie and paint a background. Mine is a nice purple even though it looks a bit blue. 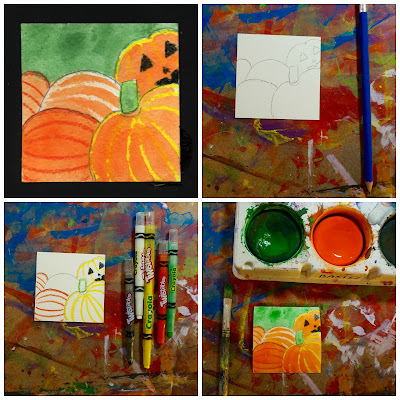 2) on another piece of wc paper or scrap draw a pumpkin with pencil first, adding all the contour lines. Go over the lines with a bead of white glue. Lay somewhere flat and safe to dry completely. 3) When dry paint in the pumpkin go right over the glue lines. 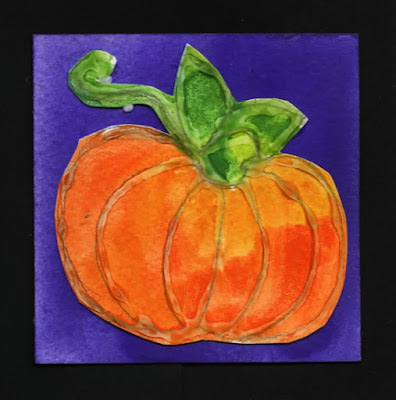 4) When the paint dries cut out the pumpkin and glue to the background. This square could be any silhouette. 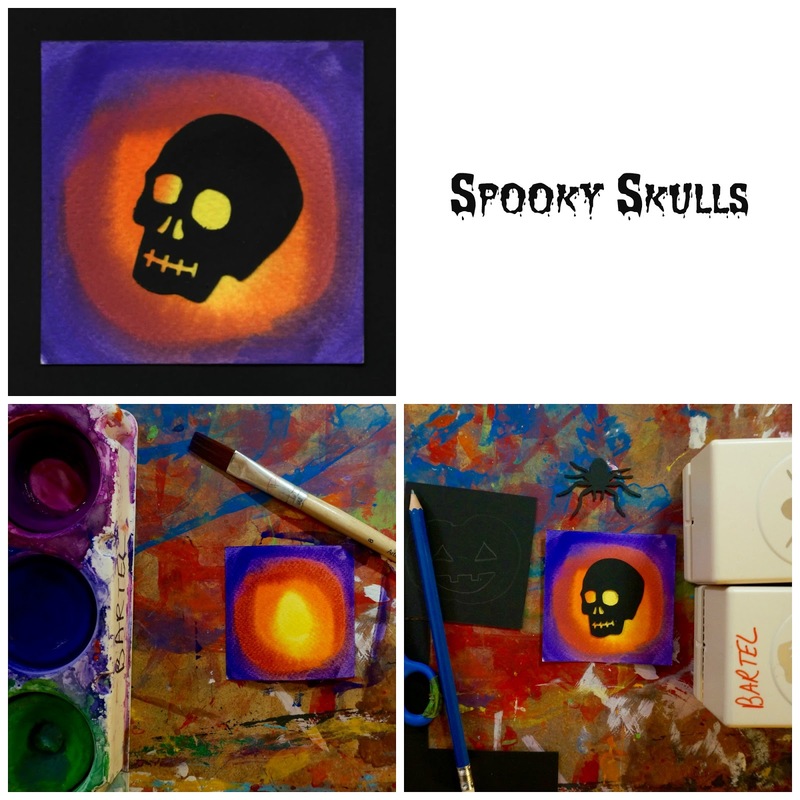 I just like this psychedelic skull effect. 1) Paint square with radiating rings starting with the lightest colour and ending with the darkest. Set aside to dry. 2) If you have a spooky punch you can use it or cut a silhouette shape out of black paper. A Jack-o-lantern woks well. Glue on top of square. This square is just so much fun! 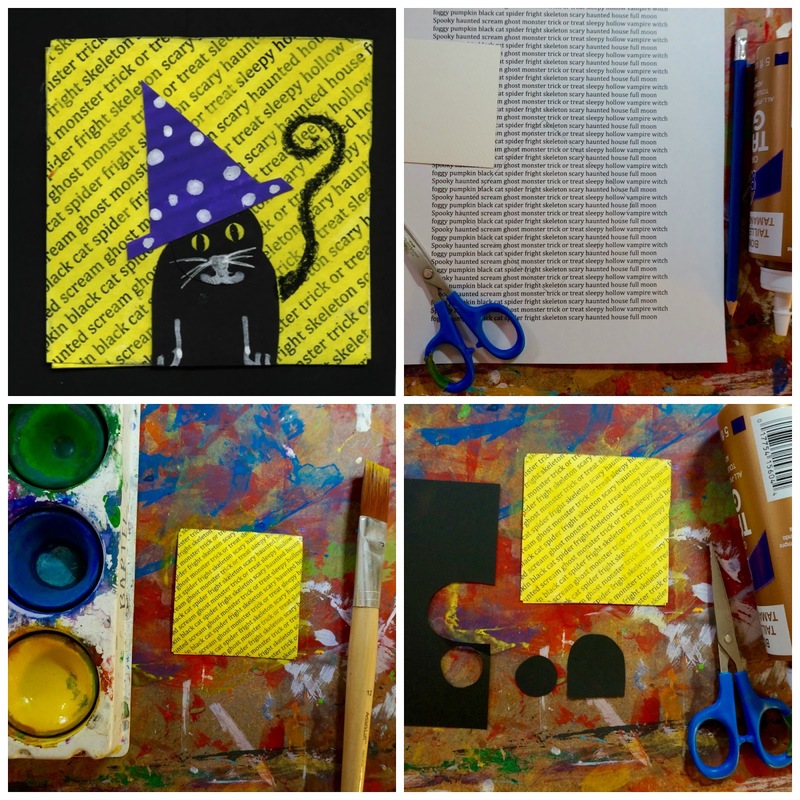 1) Cut a square out of black paper, 3"x3"
2) Using a piece of scratch foam, craft foam, or a foam plate cut another square the same size. 3) Using a blunt pencil draw your skeleton, not too many details, simple works better. Make sure you are pushing hard enough to make an impression that you can feel with your finger. 4) Paint the foam with acrylic paint that you have added just a touch of water to. White is nice but you could also use orange or light green. 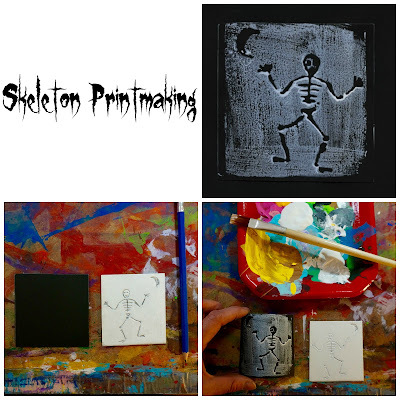 Place the foam paint side down onto the black paper and give it a quick rub with your fingers, lift and you have an amazing print. You can also try to do a "GHOST" print, that's just a second print without adding paint on another piece of paper. 1) On my computer I made a page of text of spooky words. I printed it out and then traced around my inchie square on top of it. I went for a diagonal. Cut out and glue to your inchie square. 2) Paint yellow with disk tempera. Let dry. 3) Out of some black paper I cut a semi oval and a circle. 4) I glued these in place and then cut a hat out of some extra painted paper I had. 5) With white and black sharpie or pencil crayon, or gel pen add details. 1) Take an inchie square and draw a pile of pumpkins. Have them overlap here and there and make one a jack-o-lantern. 2) Using crayons or pastels go over your lines. Add the contour lines of the pumpkins. 3) Paint with watery disk tempera. So I kept seeing this one all over Pinterest and thought it would be cute as an inchie. 1) Cut a square of black paper 3"x3". Cut a bat shape out of contact paper, peel and stick on the black paper. 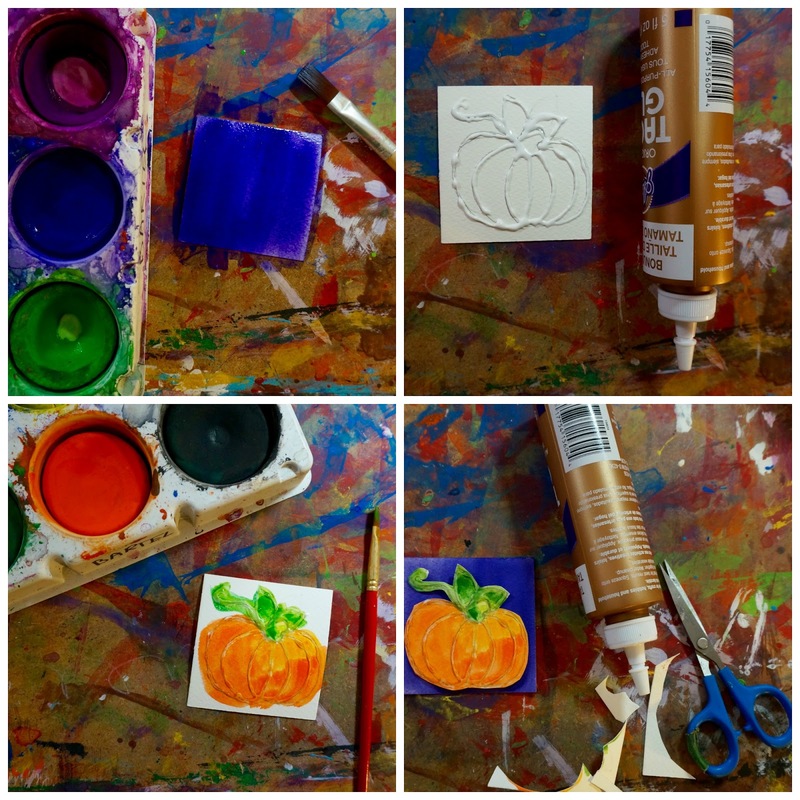 2) Using acrylic paint in Fall colours and the end of a pencil stamp the colour all over. 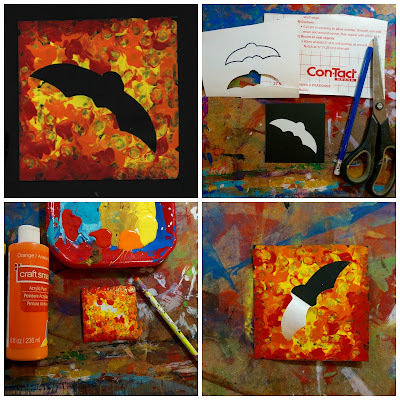 3) When the paint dries gently peel away the contact paper to reveal the Bat. I saved the best for last. This is based on this project of mine. 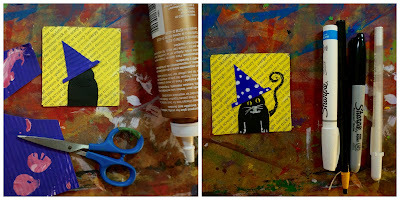 1) Paint your inchie square a stormy blue. (blue with a touch of black). Set aside to dry. Paint a few buildings on the old book page, let dry. Cut out buildings, add some windows with black pencil crayon and glue on your background. 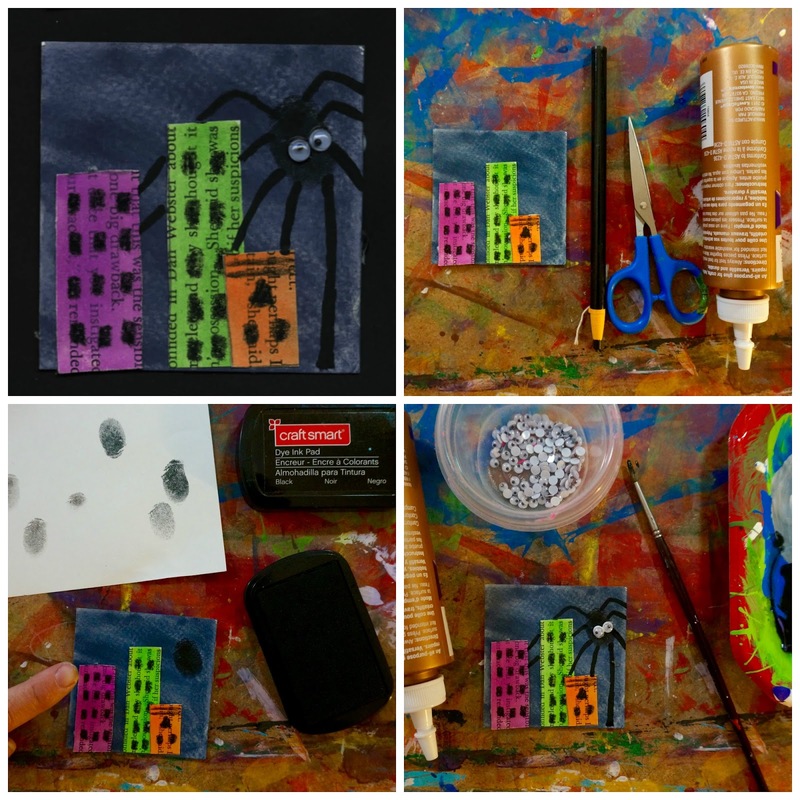 2) Using a stamp pad stamp on the body of the giant spider. 3) Add the 8 legs with paint and glue on 2 little google eyes. Glue all the squares onto black paper when they are dry and you have a nice collection. If you still want more inchie craziness check out my past projects. I absolutely love everything you do! You did a fantastic job with these little gems!!! You have a wonderfully rich imagination!!! Thanks so much for sharing your ideas. wonderful techniques - thanks so much for sharing them! I'm making these with my 2 year old this week! We're each doing a set. She loves it. Thank you so much for your creative ideas! 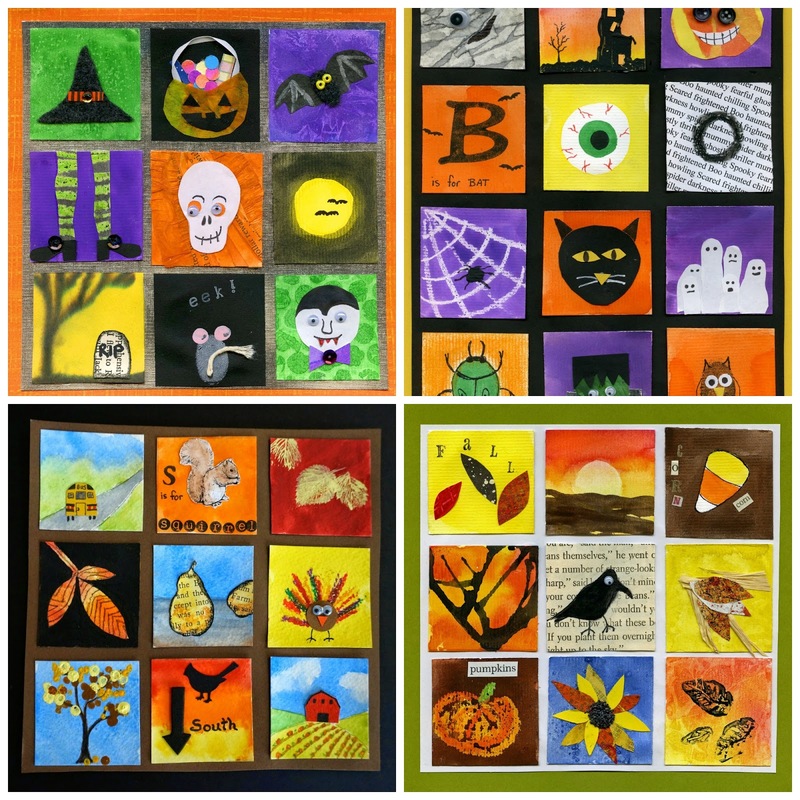 I love your website and we already did a few projects in our homeschool with our 2 kids.